This is how I roll. I have plans to go out on the town and decide, two days before the event, that I need something fun to wear. 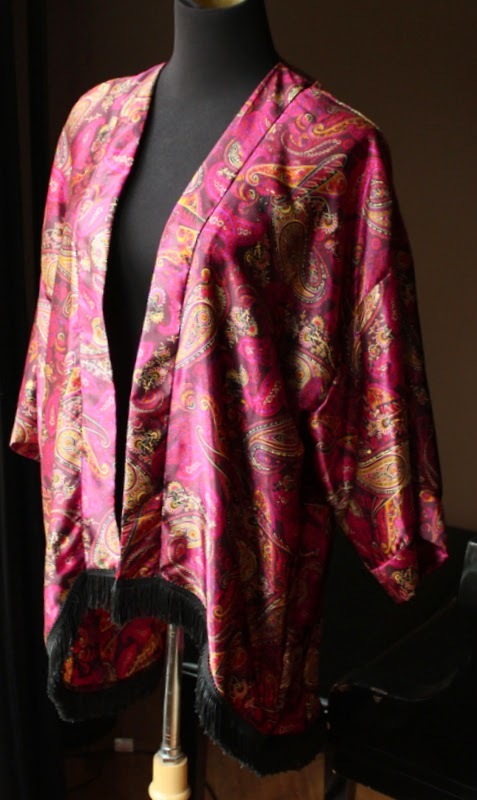 I had seen the amazing Erica B.’s fringed chiffon kimono some time ago. 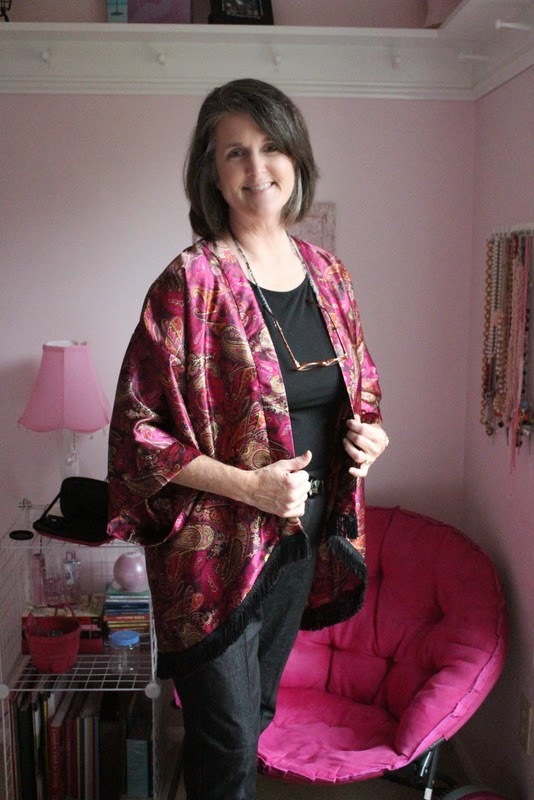 And then, last week, Annie was home from college and wearing a fringed, knit kimono. 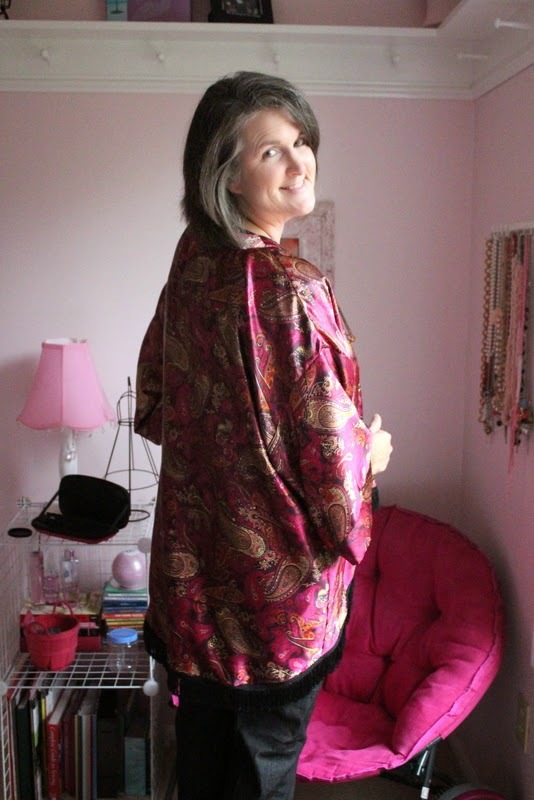 I had bought this paisley, silky fabric from Joann’s last winter in hopes of making a blouse. 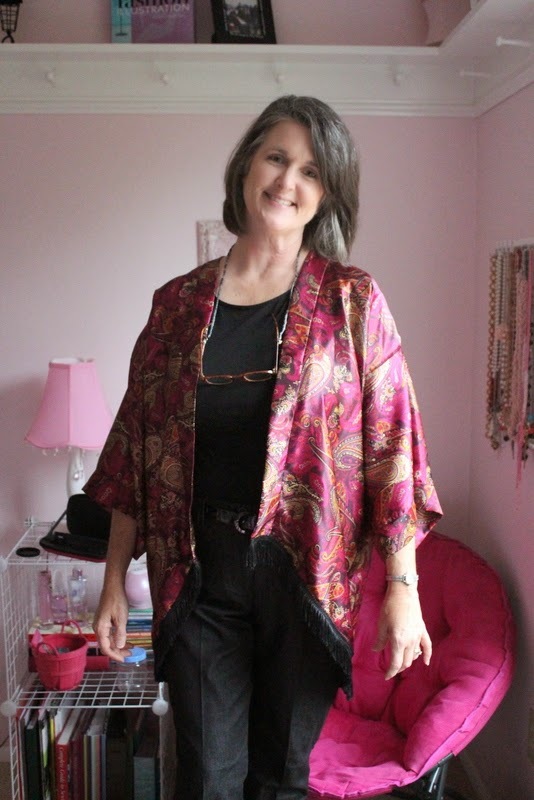 Annie said it was “ugly.” But when I suggested a kimono, my fashion student thought it would be a great fit. I was hoping the pattern would be on a $.99 sale, but instead, I purchased the Simplicity 1318 pattern, marked down 40% and used a 25% off everything coupon. I was attending a wine-tasting event in which people are dressed to all levels. I ran into Burlington and bought a pair of black, denim trousers for $15. I actually bought a belt and tucked in my shirt – I know, amazing! I was thinking this would be a really quick sew before my Archer Shirt Sew Along begins. And it was fairly quick. I don’t love sewing slippery, silky fabrics like this and I think my sewing could have been better. But I am pleased with the result. It adds a bit of oomph and drama to my usual black wardrobe. It easily dresses up a pair of jeans. As far as the pattern, it is sized XXS – XXL. 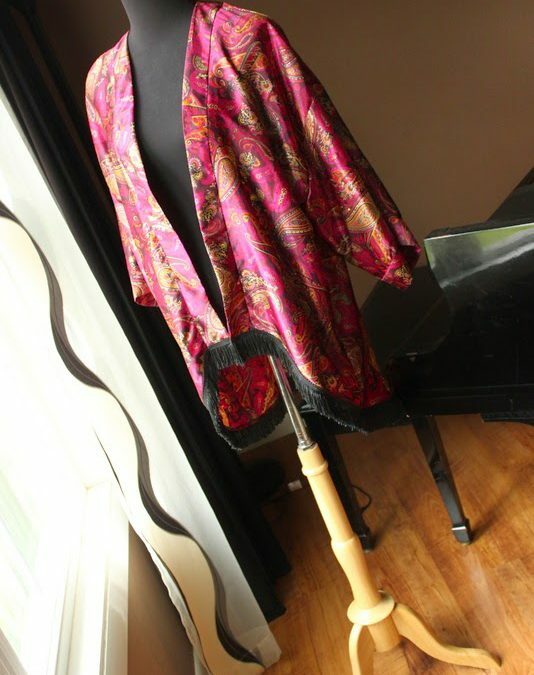 I made the size L, view C. The pattern is not difficult. I serged the seams after sewing. I thought the arm attachment was a bit fussy. With such a basic design, I don’t see why I couldn’t have sewn the arm and the side seam in one motion. I also did not do any hand stitching of the facings. I simply stitched in the ditch. I attached the fringe as Erica B. suggested – using a zig zag stitch on the back side and top stitching from the front. I am pleased with the jacket. We headed out to our wine event and about an hour into it, received a text that our son was sick, so we headed home. See, even with one teenager left in the house, life just, well, takes you on a journey. 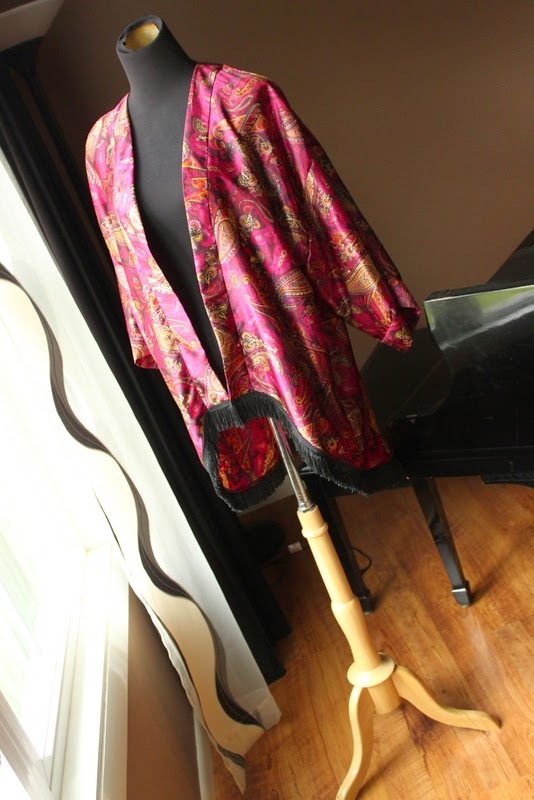 I love this – the fabric and the pattern – perfect! You look great. I might have to go find some pretty silk fabric now! Jane that color looks beautiful on you!